* Fast: You can download multiple files simultaneously with multiple connections per file, squeezing the bandwidth. * Lightweight: Takes up less than 2MB and consumes little resources. It requires no installation, is a single exe. It doesn't create giant temporary files. Just uses a small buffer in memory and stores the file directly in disk. * Secure: No ads, banners, or anything. It doesn't collect information from user. Only connects to MEGA.CO.NZ to download the files, and periodically checks for updates. Nothing else. And sensitive internal information is stored locally encrypted using DPAPI and AES. * Simple: Its interface is simple to use: add links and start downloading. That's all! 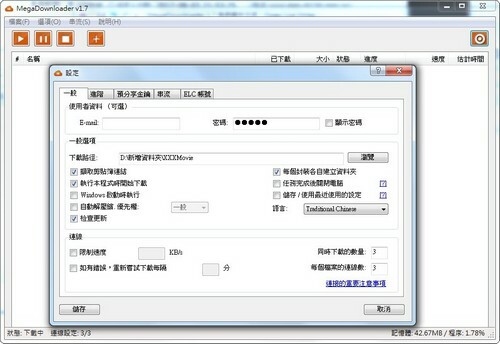 * Complete: It allows pausing, stopping and resuming file downloads. It enqueues files, grouping them by packages, automatically decompresses RAR/Zip/7z files, detects links from the clipboard, can limit the download speed, is multilingual, can be controlled from the phone / remotely with its integrated web server, can be configured to automatically start or shut down the PC when finish, can reconnect in case of error, etc. Hello there, neat website you've got here. Really useful, looking onward to coming back. You've got wonderful information right. Maybe you have been betting on basketball, baseball, horse racing online. It was in 1958 when Cantey, Mc - Dermott, Maisel and Baldwin had devised a method that triggered such commotion with the two statisticians along with the gamblers themselves. The fact is that no gambling game can guarantee that you simply win, and should you lose the money, you will not only be indebted but also cause mistrust and hurt feelings. Now, Roblox is gearing up to give its players a fair larger entrepreneurial opportunity, and sell their virtual worlds to the most important audience but.